We’ve always found that with people being so desensitized, things have to be really shocking and have to punch you in the face to get your attention. Then, once you’ve got their attention, you can say something they might remember. You have to be saved to get into heaven….you only have to be you to get into hell. The opposite of love is apathy, and hate is really the same as love-if your so consumed with hatred for someone, you might as well be loving them because your thinking about them for the same amount of time. I don’t want to feel like I’ve matured. That’s a stupid word that I never want to use. When you’re taught to love everyone, to love your enemies, then what value does that place on love? 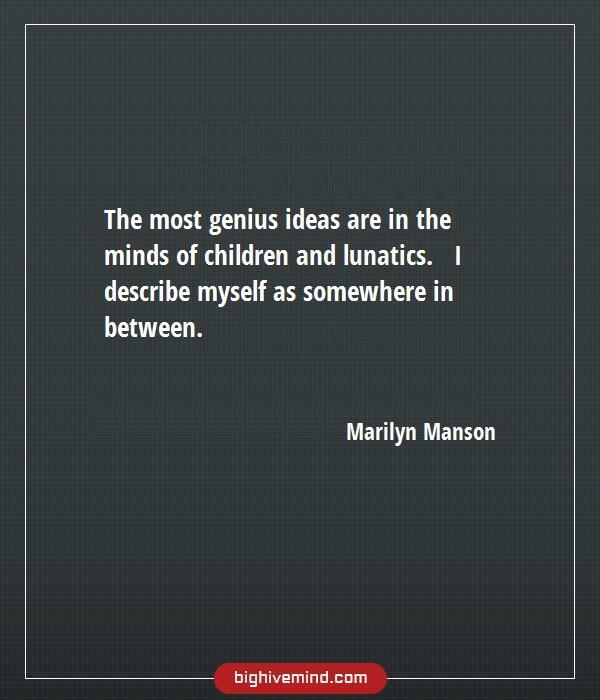 The most genius ideas are in the minds of children and lunatics. I describe myself as somewhere in between. I’m not against god, I’m against the misuse of god. Relationships never break cleanly. Like a valuable vase, they are smashed and then glued back together, smashed and glued, smashed and glued until the pieces just don’t fit together anymore. We don’t like to kill our unborn; we need them to grow up and fight our wars. I don’t want to have a gravestone. I want to have all my friends burn me and then snort the ashes. I think that’s the only way to go out. Let’s just kill everyone and let God sort them out. Just remember when you think you’re free, the crack in your heart is me. I like to make people think differently than they did before I walked in the room. In a society where you are taught to love everything, what value does that place on love?. The first time I performed musically, I threw up. The death of one is a tragedy, but death of a million is just a statistic. I don’t say things to be offensive; I say things because they’re funny to me. It amuses me. If things are too perfect, people are always so afraid that it’s going to change, so they ruin it themselves. I think art is the only thing that’s spiritual in the world. And I refuse to forced to believe in other people’s interpretations of God. I don’t think anybody should be. No one person can own the copyright to what God means. The aspiration to save the world is a morbid phenomenon of today’s youth. Leave me in a room with some crayons and I’ll draw on the wall. Not only are love and hate such closely related emotions, but it’s a lot easier to hate someone you’ve cared about than someone you never have. So anybody with any bit of intelligence has got to be pissed off because if they see how things are in the world they’re not going to be happy with it. Most of the world’s problems could be avoided if people just said what they f*cking meant. Everything I was afraid of when I was growing up, I’ve become. I’ve taken on my nightmares, like the devil and the end of the world, and I’ve become those things. but the god of all the people I hated. It’s shocking to me that it’s easier to buy a gun at Wal-Mart than it is to buy my record. You can’t force someone to see the truth, just like you can’t force a blind man to see. When I finish a picture I don’t show it to anyone if I feel it’s not good enough yet. I’ve learnt to listen to my partners and my friends. 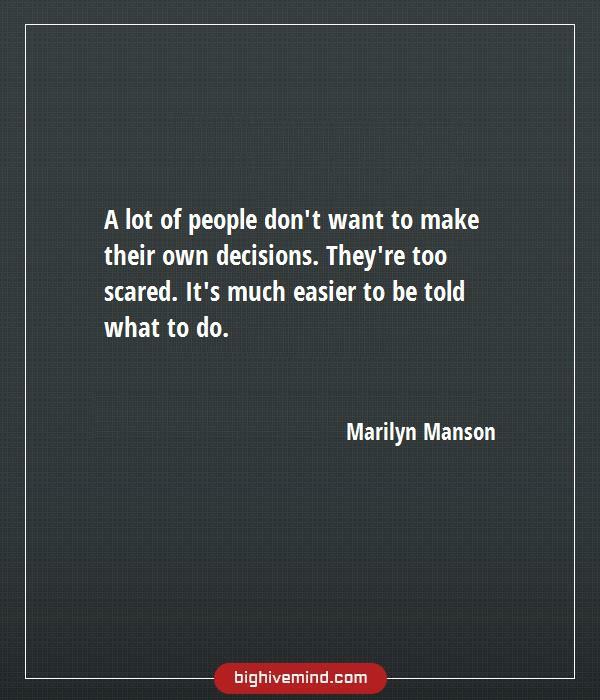 For me it’s the biggest success if they like it. I think it’s the pain and suffering that drive you to become an artist. The art itself should be the pain, sort of exorcising every demon and making you feel like you’re a person that matters. The crack inside your f*cking heart is me. Everybody feels like [a misfit] at different points in their life. If you feel like who you are is right for you, then you are beautiful. Find what you are afraid of, face it, and then you won’t be afraid of it anymore. When people say ‘I want to be like you’, I tell them if you want to be like me, then be yourself. I’m someone who is open-minded to new experiences because they teach you new things. La bestia de la cual vivían atemorizados era en realidad ellos mismos: era el hombre, no algún demonio mitológico, quien a final iba a destruir al hombre. Y esta bestia había sido creada de su miedo. It isn’t hard to find a person whom I could fall in love with, to give her romance. But it’s hard to find such a person who would understand your view on life, accept who you really are and would truly care for you. I remember growing up, saying you’re an artist it sounds pretentious but now it’s one of the only dignified things that you can call yourself. I walked away exhilarated by my success, because there’s nothing like making a difference in someone’s life, even if that difference is a lifetime of nightmares and a fortune in therapy bills. When you want to die, you at least have a goal. You’re aiming for something. It’s not a good goal, but at least you want something. And you’ve got anger and fear, but at least you’re feeling something. Yes, I’m reckless and sometime express no concern for my own well being, and I express a misanthropic view of the world, but to have an opinion, you can’t be a nihilist. There’s no reason to change what you are, but if you’re not being you, then you need to acknowledge that. The imagination is precious. Don’t lose it. Don’t lose the child in you. I’ve always believed that a person is smart. It’s people that are stupid. To admit you want to have a comeback means you have to admit you weren’t what you were supposed to be. You dropped below your own standard. I’ve found a woman I can relate to. That’s something – and I don’t even feel sappy saying it – that, if anyone has that, don’t lose it, because it’s probably the only thing that you can ever really find any satisfaction from. If I were in a room full of people, I’d rather be the person who is more interesting than the one who is wallpaper. I knew that I was supposed to respond with some kind of mannered phrase that ended with “hail satan,” but I couldn’t bring myself to do so. It seemed too empty and ritualistic, like wearing a uniform in a christian school. I fall in love with everything I also hate everything. It’s very hard to be a misanthrope and a romantic. People are too lazy and too stupid to think for themselves that we’ve got sitcoms with canned laughter that lets you know when to laugh if you’re too stupid to know when the joke is. Is adult amusement killing our children, or is killing our children amusing adults?. Sometimes you feel awkward being what you’re best at, you feel like you have to be something new. All the drugs in the world won’t save us from ourselves. Finding someone who’s willing to drown with you creates a situation where you no longer want to drown. NO WE ARE NOT DEVIL WORSHIPPERS!!! 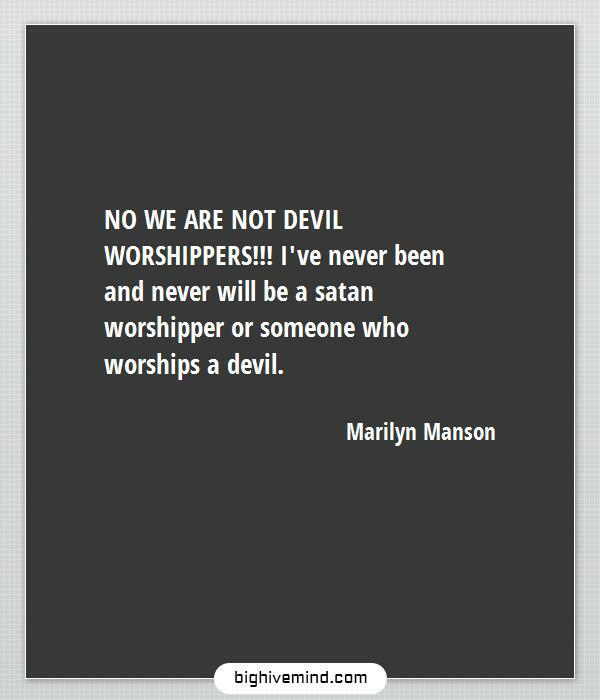 I’ve never been and never will be a satan worshipper or someone who worships a devil. There’s no time to discriminate, hate every motherf*cker that’s in your way. When someone was willing to drown with me, I really didn’t want to drown anymore. What doesn’t kill you is gonna leave a scar. I’m chaos, I’ve always been chaos, my point on Earth is chaos. Sometimes I like to get drunk and buy things on the internet, and then I wake up the next day and find ’em on my doorstep, and it’s like Christmas. I get excited. If Satan wasn’t around, churches would go out of business. Sometimes I wonder if I’m a character being written, or if I’m writing myself. In any story, the villain is the catalyst. The hero’s not a person who will bend the rules or show the cracks in his armor. He’s one-dimensional intentionally, but the villain is the person who owns up to what he is and stands by it. People drink to numb the pain and suffering. I think it’s the pain and suffering that drive you to become an artist. The art itself should be the pain, sort of exorcising every demon and making you feel like you’re a person that matters.